Smooth, creamy, and flavorful, it is the perfect sweet treat all on its own, but it is also incredibly versatile as an ingredient. 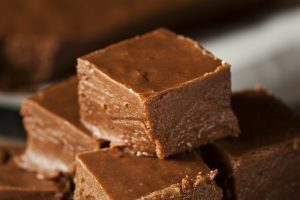 Fudge is the pinnacle of chocolate decadence. Smooth, creamy, and flavorful, it is the perfect sweet treat all on its own, but it is also incredibly versatile as an ingredient. It’s easy to find ways to use creamy, gourmet fudge in other desserts to give them an extra boost of flavor. Here are three ways you can enhance traditional dessert recipes with delicious, gourmet fudge. You probably already have a standby chocolate chip cookie recipe, and adding fudge to it will push that sweet treat to a whole new level. There are two ways you can add fudge: either as a replacement for the chocolate chips or in addition to what the recipe calls for. Chop your fudge into chocolate chip-sized pieces and fold it into the batter the same way you do with the chips. You can even jazz up your standard chocolate chip cookies by folding in chopped peanut butter fudge. Delicious! Brownies are another traditional dessert that can be elevated with fudge. You can add fudge by chopping it into chunks like you do with the cookies and folding it into the batter. Alternatively, you could melt down the fudge. Use a double boiler and combine the fudge with melted butter until it reaches good consistency for mixing, then stir it into the brownie batter for extra rich, deep chocolatey flavor. Cheesecake has a special place on dessert tables, and it can be made even more amazing when you add gourmet fudge. Similar to the fudge brownies, you can either chop the fudge into chunks or melt it down to use it. The melted fudge can be thoroughly mixed into the cheesecake batter or swirled through for a gorgeous marble effect. This is another dessert where flavored fudge can really shine. Imagine a standard cheesecake swirled with melted cookies and cream fudge. Or a chocolate cheesecake with chunks of vanilla walnut fudge folded in. Or a cheesecake version of a s’more with rocky road fudge chunks with marshmallows in it. ENJOY THE REST OF YOUR SUMMER WITH WOCKENFUSS! With gourmet chocolates and candies this good, you will find the best candies for every guest at all of your summer get-togethers! Since 1915, Wockenfuss has been a family owned and operated business creating the finest confections in Baltimore, Maryland. With our nine convenient locations throughout Maryland, there is sure to be a Wockenfuss store near you. Come and visit us to see our selection of summer favorites such as our gourmet truffles & chocolate specialties. We’d be happy to help you select the perfect sweet treat, whether for you or as a gift for a loved one. If you have any questions about our sweet seasonal candies, please contact Wockenfuss Candies by calling us at 1-800-296-4414 or emailing info@Wockenfusscandies.com. When you’re not savoring our sweets, stay satisfied by following us on Facebook, Twitter, Google+, and Pinterest too! This entry was posted on Thursday, August 23rd, 2018 at 4:15 pm. You can skip to the end and leave a response. Pinging is currently not allowed.